When thinking about your health, it’s easy to focus on physical fitness. After all, most people associate their health with hitting the gym, eating right, and staying active. There’s no denying that physical health is important, but it’s equally important that you take the time to work on your mental wellness. Luckily for you, the NeuroSky App Store is filled with thousands of mental wellness apps for you to use with your MindWave headset. These apps can be used to help users promote relaxation train their ability to focus, and simply unwind after a long day. If you’re new to mental wellness apps, you may be looking for some insight on which ones are right for you. To make things simple for you, we’ve compiled a list of our favorite mental wellness apps to help you get started on your journey toward well-being. Home of Attention is a mental wellness app that strives to improve both attentiveness and your ability to focus. Through the use of carefully curated cognitive exercises, Home of Attention helps you relax, focus, and concentrate. Designed in collaboration between psychologists and neurofeedback experts, Home of Attention comes with 5 predefined training settings to help you effectively deal with stress and exhaustion. It also includes an assessment tool that helps you analyze your training process. Best of all, Home of Attention also allows you to design training programs to achieve your goals. You can learn more about Home of Attention here, and get your own copy in the App Store. Whether you’re new to meditation or one deep breath away from total enlightenment, the Meditation Journal is a fantastic app to have on hand. When in use, Meditation Journal can keep track of your daily meditation and attention levels in a digital calendar, allowing you to track your progress, view data charts, reach predetermined goals, and receive notifications of your accomplishments. The Mediation Journal is available for download in here. Meditation isn’t just for adults. In fact, it has already replaced detention in some schools with impressive results. Mental wellness apps provide you with the opportunity to bring meditation home for children in fun and engaging ways. Take Kidzen, for example. This bilingual (English & Spanish) app is designed to improve concentration levels and attention skills in children ages 7 through 12. Kidzen uses fun activities to reinforce working memory and impulse control, while also helping with the receiving and processing of information. Kidzen will improve your child’s self-esteem and help them feel more in sync with their brain functions. You can get your copy of Kidzen here. Art of Zen is designed to provide users with a relaxing and balanced sense of calm. Using the NeuroSky biofeedback system, Art of Zen measures your inner zen level and showcases it in the form of dynamic flowing colors and patterns. Art of Zen is not designed to be competitive; instead, it provides users with a captivating measurement of their inner state in a fun and interactive way! Start showing off your artistic state of mind by grabbing the Art of Zen from the App Store today. The four mental wellness apps we’ve mentioned above are a small sample of the options currently available to you in the NeuroSky App Store. Young or old, these apps can help you take control of your mental wellness, improving your state of wellness and overall happiness. 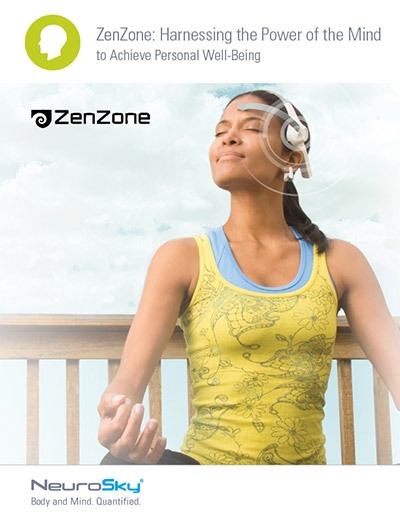 One popular mental wellness app developer we did not mention here is ZenZone. Formerly known as NeuroCoach, ZenZone’s unique approach to mental wellness app development has led to their technology being adopted by the United Kingdom’s National Health Service—the public health services provider of the UK. To learn more about their success, grab a copy of our FREE whitepaper, ZenZone: Harnessing the Power of the Mind to Achieve Personal Well-Being today!